17th Annual Winter Isshinryu Karate Seminar at the Orange City dojo on January 14, 2012, attracts many martial artists from the Eastern U. S. and Puerto Rico! 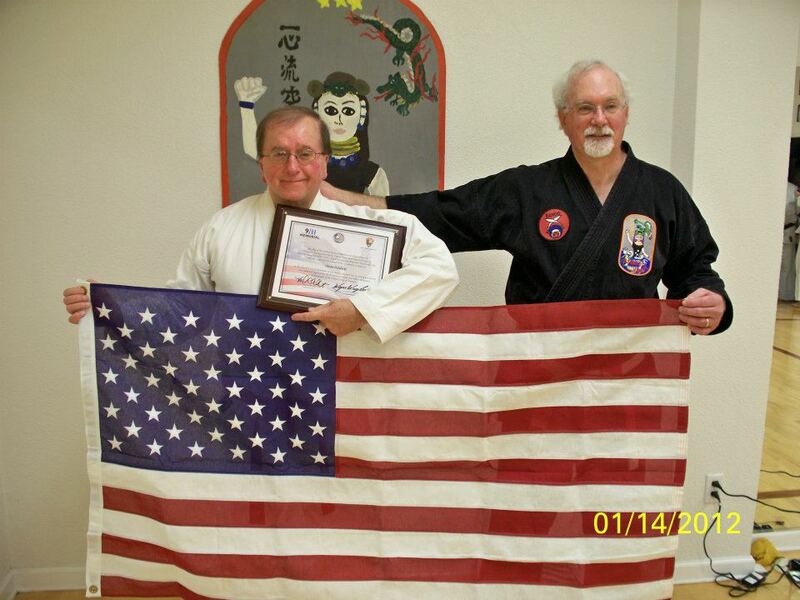 Grand Master Holubecki, Massachusetts, accepts a VERY SPECIAL award from Master Wayland, Virginia. The plaque attests that the flag presented to him was flown over “Ground Zero” in New York City, NY, over “Patriots’ Field” in Shanksville, PA, over the Pentagon, in Arlington, VA, and over the United States Capitol, in Washington, D.C., in honor of all those who were lost during the tragic events of 9/11/01, during the 10th Anniversary ceremonies held in New York, Pennsylvania, Arlington and Washington on 9/11/11. What an honor and what an award! It brought tears to Grand Master Holubecki and to many of those in attendance. Click on image for more photos!